In our previous Tech Tip we explained how to get started with Cortana. Now that you are ready, let’s take a look at how Cortana can help you remember! To get started, type a question in the search box in your taskbar, or select the microphone to the right of it to talk to Cortana. (Typing works for all types of PCs, but you need a microphone to actually talk to her.) If you’re not sure what to say, you’ll see suggestions on your lock screen, and in Cortana Home when you select the search box. Keep in mind that you must first be signed in to Cortana, as well as be connect to your Office 365 or Outlook account and give communication consent for Cortana to be able to work her magic! With Cortana, Microsoft wants to make sure you can keep your promises. Cortana helps you remember in many ways: setting reminders for the right time, place, or person; creating reminders from sticky notes you’ve inked; and organizing your lists. When Cortana sends you her reminder, you might need to set a new time for another reminder at a more convenient time. When that said reminder pops up, simply tap the reminder’s title and you will now be able to set a new reminder time. Fancy, isn’t it? Cortana can remind you to do things based on time, places, or even people. For example, type or say, “Remind me to congratulate Sam the next time she calls.” The reminder will appear when you get a call from Sam. For an extra bonus—reminders sync across your devices not only on a Windows phone but on an Android and iOS, too. Additionally, Cortana is also able to set and keep location-based reminders. For example: If you tell Cortana, “Remind me to get eggs next time I’m at the supermarket,” she’ll show you a list of nearby stores to choose from. Tap Any and she’ll remind you the next time you’re at any supermarket. On top of all this, Cortana – like a real personal assistant – is intelligent enough to understand how you may uniquely like to work – including the hours you like to set meetings and those in which you are most productive. So if you are a morning person and you get a meeting request come through for 7pm, Cortana will alert you that you have a meeting outside of your regular times so that you can take action quickly to move it to a better time. 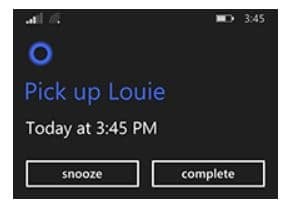 The same goes for last minute meetings – say it’s 8pm and your boss has sent you an urgent meeting request for 7am the next day – Cortana will alert you that there’s a meeting that may need your attention, so you can adjust your alarm and morning routine accordingly and stay on top of your day. What does the Windows 10 Creators Update mean for Cortana? She will now be able to set recurring reminders. She will now be able to scan your Office 365 or Outlook email account for commitments you’ve made and automatically configure reminders. When verbally summoned, she will now appear as enhanced full-screen version. Use Cortana to turn off, restart, or lock your Windows 10 PC, as well as put it into sleep mode. She supports voice commands for audio playback controls on Windows 10 apps (e.g. iHeartRadio). Cortana will provide the ability to sync content on your clipboard to another device. She will allow you to sync notifications between your phone and your Windows 10 PC and vice versa. 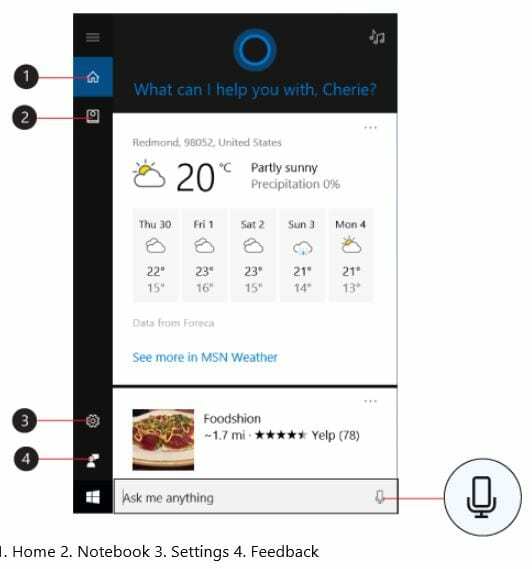 Cortana will remind you of the Windows 10 Creators Update, as well as assist and guide you through the actual setup process of it.